As the American family becomes increasingly complex, so do parents’ wills. The result has been a dramatic increase over the past two decades in the share of wills in which parents distribute their estate’s assets unequally among their genetic offspring and stepchildren. New research, based on surveys of older Americans, finds that about one-third of parents today do not distribute their assets equally. The reasons range from the greater incidence of divorce and the inherent disadvantage of being a stepchild to the fact that some children naturally take on the role of caring for their aging parents. With parents now living longer and needing more care, children may receive compensation in the will for providing that care. Some 16 percent of children live with a stepparent and often half-siblings in so-called blended families. But parents with stepchildren are considerably less likely to include all of their children than are parents who have only biological offspring. This is more true for women with stepchildren than for men with stepchildren. Divorced and widowed parents are even less likely to divide their assets evenly if they have stepchildren. For biological children, contact becomes key to whether parents have a will and also whether the children are included. Parents with little or no contact with offspring are much less likely to leave bequests to them. Wealth also plays a role. Wealthier parents are more likely to have a will and to include stepchildren and children with whom they have had little or no contact. Parents in poor health are less likely to include all of their children. This suggests that bequests are used “to elicit a long-term flow of [caregiving] services” in old age, the researchers concluded. Equal bequests remain dominant in traditional families in which biological offspring have maintained contact with their aging parents. But in the growing ranks of complex families, the researchers found “substantial” differences in their bequests. Very interesting about the amount of contact children have and the incentive to include them in the “goodies” in a bequest. Makes sense…. 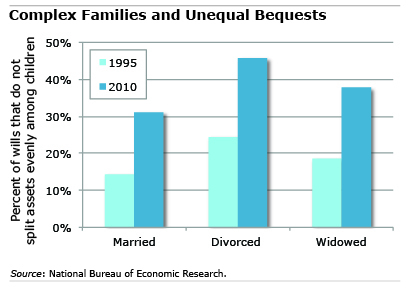 One aspect of the unequal bequests is not mentioned. The step-children have another parent that may be leaving them money. My step-daughters have already inherited from their biological mother. Their half-brother, my son, will get more of the estate, because it’s the only time he’ll inherit. Financially, the kids will end up equal over the 3 estates. Interesting Wendy- and evening things out is not something captured in the research that’s also arising due to complex families! Ummm….Stepchildren have never been considered “natural heirs to a bounty.” No state recognizes stepchildren in the intestate succession. The real news here is that people who write wills may be doing so to make sure that stepchildren get something — this is actually equalizing the bounty, not making it less equal, as the headline and story suggest. Really? No state in the world recognizes stepchildren in the intestate succession? Children may all be born equal, but as they go through life, their relationship with their parents will not always remain equal. Some will continue to honor their parents while others scorn them. Some are extremely successful on their own and others have made a lifetime of poor choices leading to financial disasters. The research and title of the article implies that each child SHOULD receive an equal share. This is a very biased and unrealistic position. Some children should be rewarded at the time of their parents’ death and others need to reap what they have sewn. To bequeath an equal financial benefit to all can very easily be a major slap in the face of the child who did the right things. In many situations, none of the children should receive anything, it should all go to charity. A good financial adviser will assist their clients in exploring these alternatives.